1. I'll watch Grease, but that's only because Beth watches it. 3. Because of Echo, I'm more aware of Grey's Anatomy than I care to admit. 4. Any reality TV show makes me feel less messed up than I actually am. 5. Since being a part of my brother's life, I can sing the theme song to Phineas and Ferb. Mwahahah! I can sing the Phineas and Ferb theme song, too. We haz so much in common! Do you and Noah share any of the same guilty pleasure viewing habits? And have you guys noticed that all of Noah's responses revolve around other people? What a sweetie pie! Wow! Both of those letters are great in their own way! 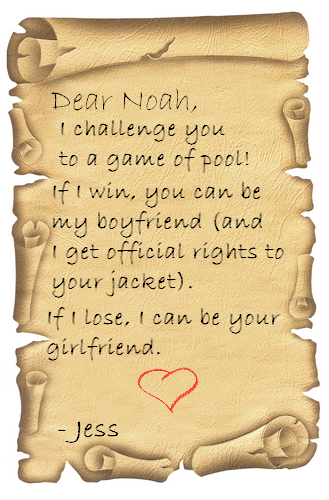 :) They really show off how lovable Noah is, huh? Gives you good reason to vote for him in the YA Crush Tourney on June 21!